The race to determine who will represent San Diego’s 52nd Congressional District has not yet been officially determined, but with 260,000 mail in/absentee ballots from all around San Diego County left to be counted, Democratic challenger Scott Peters’ lead over Republican incumbent Brian Bilbray has grown. With the latest vote tally showing 118,476 votes for Peters to Bilbray’s 116,577, Peters’ lead extended to 1,899 votes since the last official update from the Registrar of Voters on Friday. No word yet on when a winner will be declared. The latest count comes on the heels of Republican incumbent Mary Bono-Mack’s concession last Friday in the CA 36th District race. Bono-Mack served seven terms in the Palm Springs area district, having succeeded her late husband Sunny Bono, who died in a skiing accident. She lost her latest reelection bid to Democrat Raul Ruiz, who will take the oath of office in January. Bono-Mack is married to outgoing Florida Congressman Connie Mack, who lost his bid for the Florida Senate seat to Democratic incumbent Bill Nelson. Her loss is perhaps a reflection of her own tone deafness and that of the GOP as a whole to immigration issues and toward Latinos in general. The Latino community in her Inland Empire district have long complained about her lack of concern for issues important to the community there. Ruiz was the first Latino challenger to her seat that she had faced. 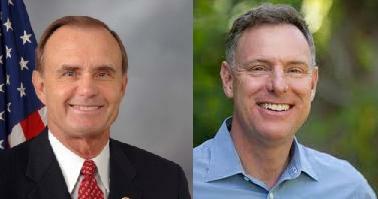 In Sacramento’s 7th Congressional District Race, Democrat Ami Bera held a 1,779 vote lead over incumbent Republican Dan Lungren. Lungren is currently the Chairman of the House Administration Committee, which would oversee any disputes should it become a contested election. Thanks for the update, Andy. It’s been hard to find current info . According to the Registrar of Voters website, 100 percent of the precincts turned in ballots and Scott Peters beat Brian Bilbray 50.40% to 49.60%. Forgot to add that “The Progressive” magazine listed Bilbray as one of Congress’ “ten dimmest bulbs” in an article by Ken Silverstein back in 1995. The real tragedy is that we cannot seem to get rid of Duncan Hunter’s idiot son. Mr. Mike: Take a look at the top of the “Election Results” page on the Registrar of Voters site. It clearly says, that as of last night’s update, approximately 260,000 mail in/provisional ballots throughout San Diego County remain to be counted, as I’ve noted. The “100% reporting” you cite is for actual in-person voting on Nov. 6. So no, the election has not yet been officially decided, and it’s theoretically plausible that of those 260,000 remaining ballots (only a fraction of which will have been eligible to vote for a rep in the 52nd District) the Registrar will find more than 1,899 votes to close the gap between Bilbray and Peters. It is unlikely, however, given that it is Democrats that typically take advantage of early voting more so than Republicans (don’t know about DTS voters), and since the count of mail in/provisional ballots began in earnest after election day, Peters’ lead has done nothing but slowly and steadily grow. Dear Readers: the SDFP site is partially down – we are unable to edit or post articles or moderate any new comments. Please bear with us.